The Salt of Ancient Tears, is a high-concept story of romantic adventure and suspense. It’s a story that addresses the growing awareness of #MeToo, while spotlighting strong female characters. The story features a main character who takes control of her life, successfully brings down a wealthy sociopath, and emerges the woman she has longed to be. The story: In the early fifteenth century, the last Viking settlement on Greenland was subject to an inexplicable catastrophe. The entire population of several thousand souls simply vanished, leaving behind deserted homes and abandoned fields. One of history’s most intriguing mysteries, the fate of the Greenland Norse has never been resolved. Until now. 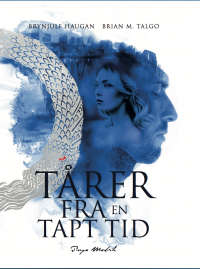 Oslo, present day: Julia is a woman who cannot commit, and Magnus is a man who cannot choose; two strangers going about their lives, alone, out of touch and out of place. Burdened by feelings they can’t understand, Julia and Magnus struggle to chase away the shadowy memories that haunt their dreams. An archaic Viking symbol, the Jörmungandr, a serpent biting its tail, leads each of them to enigmatic physician Leonard Koll. Using an unorthodox combination of acupuncture and hypnosis—the ancient Tibetan Wind in the Blood—Leonard helps them to uncover a brutal past existence in medieval Norse Greenland, setting them on a course to unravel the origins of their dark feelings. This cathartic experience ultimately proves to be fatefully linked to present events as well as resolving the age-old mystery of Norse Greenland, and an undying love between two star-crossed souls.